Every year on 10/10, as a part of Archives Month, archives around the nation promote awareness of electronic records. Today is a great day to think about how you use digital records and how you manage them. Electronic records surround us everyday, just as paper records do. Every text or email you send, online form you fill out, tweet you share, website you visit, and photo or video you take on your phone is a digital record. While some of the same basic principles for organizing paper records apply to digital, it can be daunting to manage and preserve all of these born digital materials. During this day to celebrate women around the globe, one of our colleagues at the University of North Carolina had a interesting idea: take the “A Day Without A Woman” observance, turn today into “A Day Without Unidentified Women” and give the women in our archival photo collections their identities back. We think it is a wonderful idea but we need your help! Not all of the photos of women in our collection are identified in our catalog records, but you may recognize them. To help us update our records and give these women their identities back, follow these links to photos including either the term “unidentified woman” or “unidentified women” in our online photo database. If you recognize someone in a photo, either send us an email with the URL link to the image and a updated description OR leave a note here in the comments so we can see how many women have been identified today. 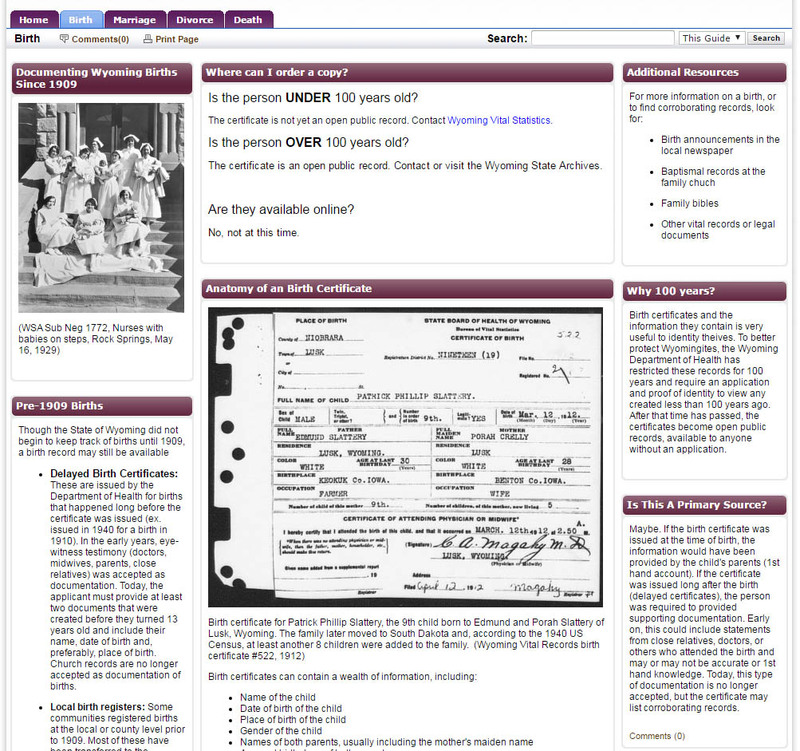 Don’t forget to try your hand at identifying women in other archives and museum collections! How did you become associated with the Wyoming State Archives? I received an MA in History from Colorado State University, with an emphasis in archival management, in 1985, about the time job opportunities for prospective archivists became scarce (after a hiring boom). I kept busy with volunteering and part-time jobs at CSU, the Fort Collins Museum, and with a microfilm / records storage business. In 1987 I found out that the Wyoming State Archives was seeking an archivist for a grant funded position. I applied for the job, which involved the arrangement and description of records from the State Engineers’s Office and records of Wyoming’s governors. I was hired and worked on two grant-funded projects before I was selected to fill a vacant permanent position. 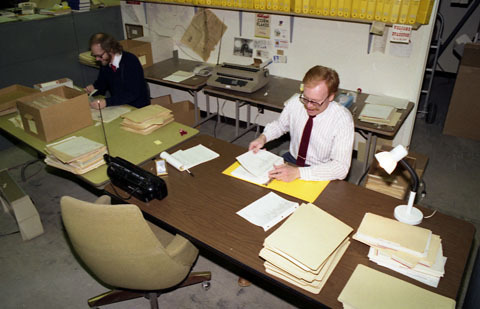 Curtis (right) and Carl Hallberg updating finding aid binders and processing collections in the mid-1990s. How has the WSA changed over the years? How did your duties change? Of course the amount of material managed and stored has grown many times the amount the Archives had when I started. The use and management of technology has been a major change. When I started we typed letters and finding aids on typewriters. Staff had to share our first computer. Now most information is created digitally. Managing, preserving, and providing access to digital records has been a big challenge for archivists. My duties initially focused on arranging and describing collections, as well as assisting the public with access to information. 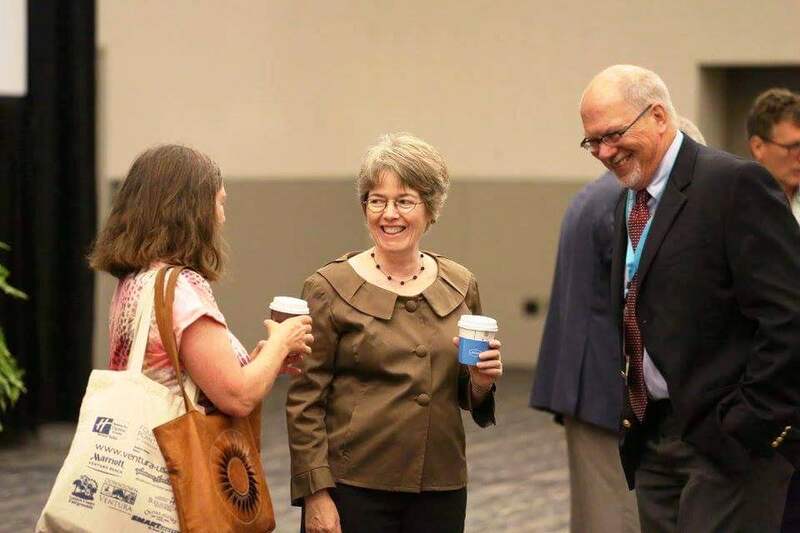 Early in my career I was also being steered toward a focus on electronic records, but these efforts were stymied by lack of funds for equipment and training. When I became a supervisor my duties broadened to overall collection management issues, developing procedures and planning, and personnel matters. I continued to assist with processing new collections, which I enjoyed doing. Later on, the supervision of microfilming and scanning operations was assigned to me. Managing the increasing volume of information in all formats has been a constant challenge. What do you see as your legacy/greatest achievement of your career at the WSA? I don’t know about a legacy. I’ve been involved in the continued effort to improve how we manage and provide access to information, and how we meet the needs of our constituents. The records at the Wyoming State Archives help document who we are and where we’ve come from. I think that knowledge is very important, and therefore the preservation of the historical record is very important, as is maintaining personal information needed by Wyoming’s citizens. Being involved in that effort has been rewarding. Curtis pauses during a reception in the Reading Room to answer a call from a researcher. Do you have a favorite collection? Project? A favorite collection is tough. There are so many interesting ones. What comes to mind at this time is the Campbell Collection, records relating to the lives of Wyoming’s first governor, John Campbell, and his wife, Isabella. The collection includes their diaries. Isabella Campbell’s diaries contain entries recorded when she resided in Philadelphia and Washington D.C. during the years 1864-1866. Though most of the entries deal with personal and family matters, the diaries also reveal something of what life was like in mid-19th century America, and provide a few glimpses of civilian reactions to Civil War events and the assassination of President Lincoln. Governor Campbell’s diaries, 1869-1876, cover his years in Wyoming Territory, and almost two years after he left the Governor’s Office. The collection also includes letters to Governor Campbell from family, friends, favor seekers, and business and political acquaintances. There are references to and correspondence with Wyoming’s political leaders and United States government and military leaders. Favorite projects include writing administrative histories for state agencies for a Guide to the Archives of Wyoming, planning and organizing events for the grand re-opening of the Barrett Building, where the Archives is housed, after it was renovated, planning for various Archives Month activities, and being involved with strategic planning for the agency, to name a few. What is your favorite memory/story? 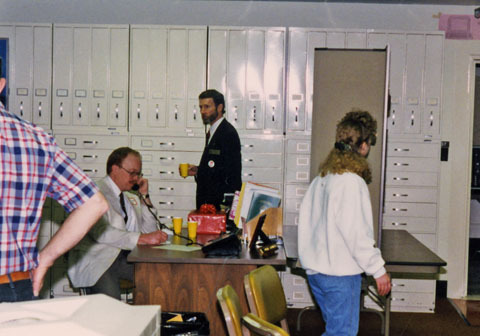 A humorous story involves co-worker Carl Hallberg. In the mid-90s Carl and I were in Rawlins at the State Penitentiary, reviewing and boxing records for transporting to the State Archives. It was a long process and we were there during the lunch hour. A Penitentiary staff member suggested we have lunch in the cafeteria, which also served less risky inmates. The food was free and we didn’t have to leave the site so we agreed. We arrived in the cafeteria toward the end of when lunch was served. When the last inmate left, the guard, apparently not noticing us in our corner, locked up the facility. When we finished our lunch, Carl and I discovered we had become inmates. Fortunately, a trustee who worked in the kitchen was still on duty and eventually discovered our plight. He led us through the kitchen to an exit door. 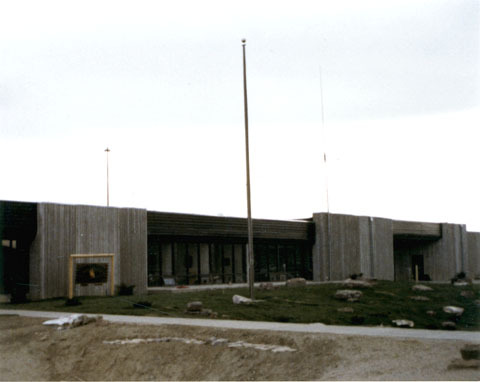 Wyoming State Penitentiary Administration Building, Rawlins. Overall, visiting many of the state’s historic sites, museums, and historical records repositories as part of the job has been enjoyable. You have written many posts for our blog over the years, do you have a favorite? Were there other topics you would have liked to explore? Did/do you enjoy writing? My favorite was probably the one about Tim McCoy. His story is quite remarkable. I also enjoyed the governors’ birthday series. Like McCoy, many of these men started life in very humble situations, but they took advantage of opportunities available in Wyoming, worked hard, and occasionally benefited from fortunate circumstances. The last couple of posts I wrote dealt with lesser known collections. I probably would have continued to write about those. What was your least favorite task/project? As I mentioned, the first project I worked on was the organization of State Engineer records. This included a very large amount of general correspondence that needed to be put in alphabetical or chronological order. This tedious task took many months to finish. I was glad to move on to something else. Do you have plans for your retirement? I’ll be assisting my wife with her business, working on honey do’s, and maybe doing some writing. Thank you for the memories, Curtis. We’ll miss you but hope you enjoy a long and well-earned retirement! Researching in an archive can be daunting. So can tracking down primary sources on a topic. Sometimes you just have questions about where to go for more information or how exactly to request information. Thankfully, help has arrived! 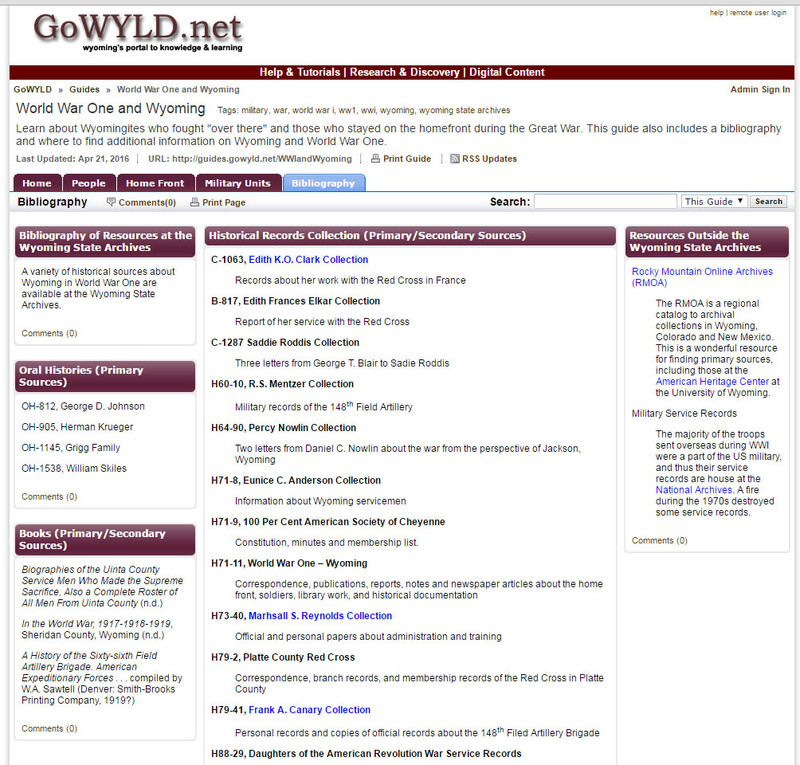 The Wyoming State Archives is rolling out a new resource for how-to and bibliographic information called LibGuides. These guides are a part of the Wyoming State Library‘s growing collection of guides on a variety of topics. 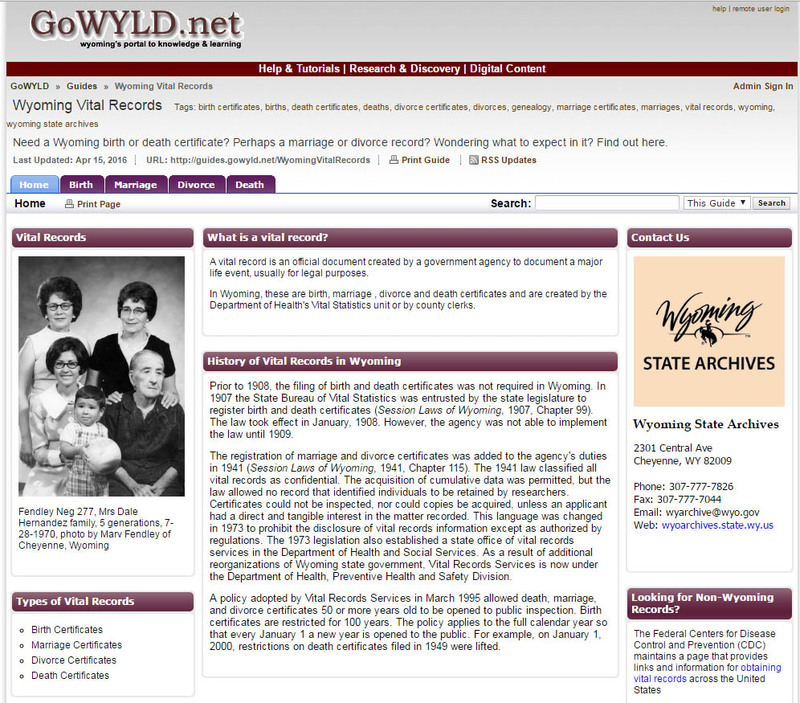 Wyoming Vital Records – Need a Wyoming birth or death certificate? Perhaps a marriage or divorce record? Wondering what to expect in it? Find out here. Women’s Suffrage in Wyoming – Since 1869, Wyoming’s women have been guaranteed suffrage: the right to vote in elections and hold public office. They were the first in the nation to be granted this right. Learn more in this guide about women’s suffrage in the state. World War One and Wyoming – Learn about Wyomingites who fought “over there” and those who stayed on the homefront during the Great War. This guide also includes a bibliography and where to find additional information on Wyoming and World War One. Tom Horn – Learn more about the infamous Tom Horn, his trial and execution in 1903. This guide also include a bibliography and where to find additional information. Each guide is tailored to the topic it covers and answers questions like: Where do I find ___? Is it a primary/secondary source? How can I request a copy? Where can I find more information? Information about births from the Wyoming Vital Records guide. Several of our new LibGuides also contain bibliographies. These are lists of archival collections, manuscripts, photograph collections, maps, books, articles, etc. on the topic of interest. Links are provided where the resources are available online. Check out the guides and let us know what you think of them! Have a suggestion for a guide? Tell us what you’d like to see in the comments below. With all the presidential hopefully tossing their hats in to the ring this year, we thought it might be fun to take a look back at an unusual presidential candidate who made a brief stop in Wyoming in 1940. 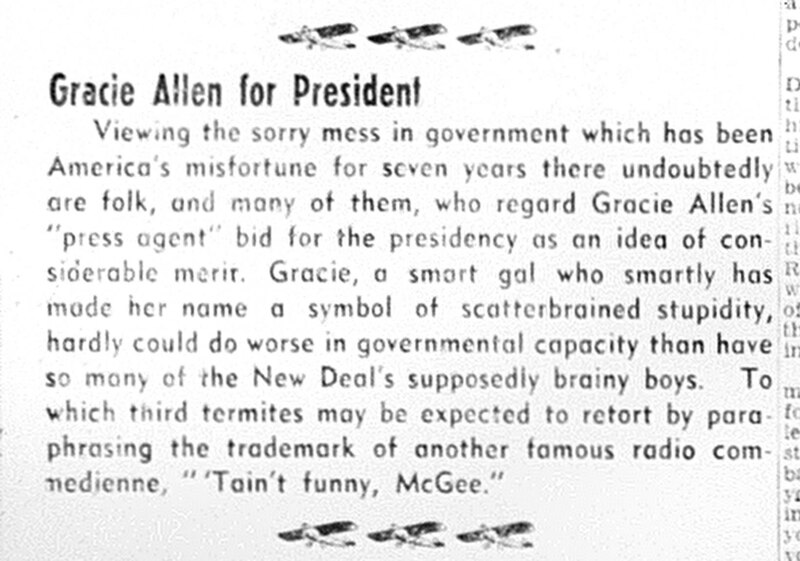 That year, Gracie Allen, half of the comedic power couple Burns and Allen, declared that she would run for president in her very own Surprise Party. 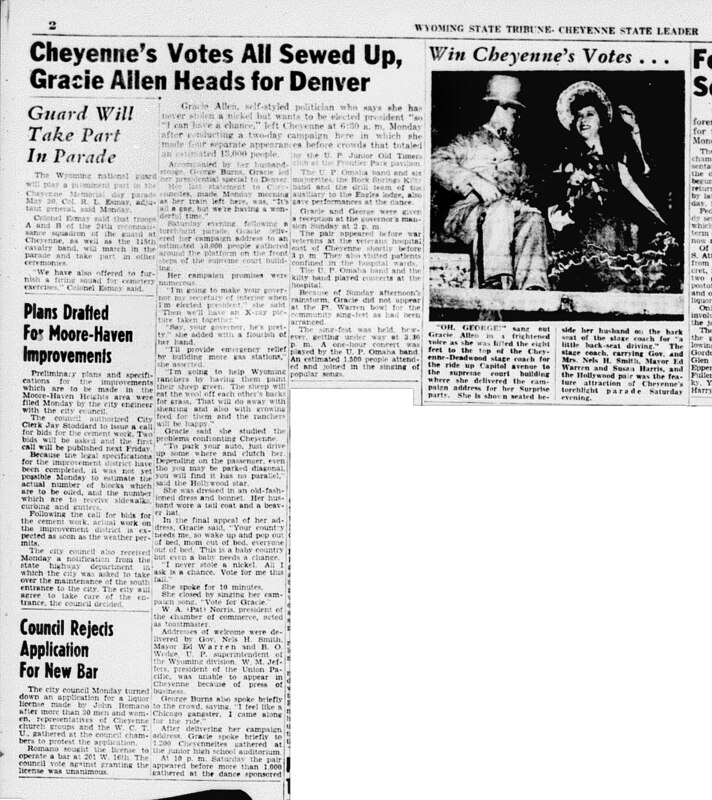 This editorial appeared in the Cheyenne newspaper a few days before Gracie’s stop in Cheyenne. It all started as an ongoing radio joke, with Gracie appearing on various other programs to “promote” her campaign to be the first female president. 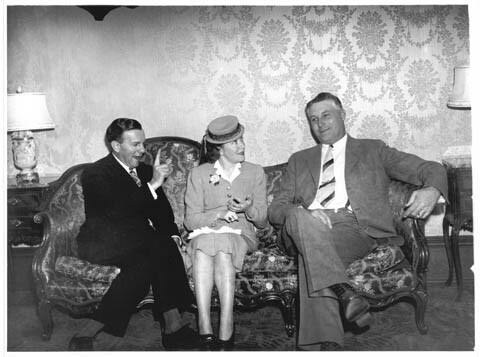 In the following weeks, the gag became so popular that she received invitations from the City of Omaha to host her Surprise Party’s “national convention” as well as an invitation to speak at the National Press Women’s Club by none other than Eleanor Roosevelt, first lady and wife of candidate Roosevelt himself. She was even endorsed by FDR’s alma mater Harvard! Marketing opportunities abounded during the campaign, as seen in this ad from Rawlins. 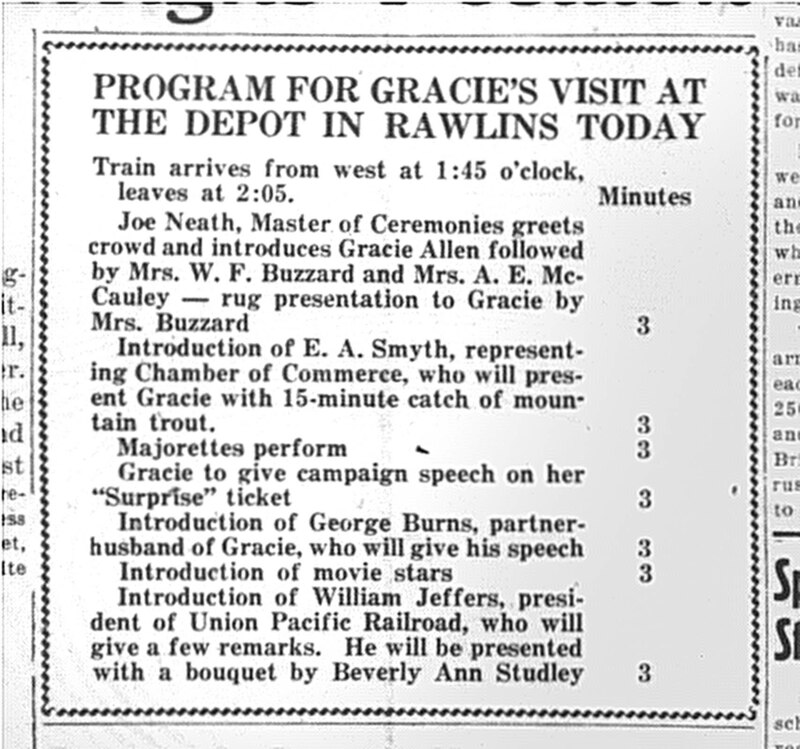 In conjunction with Omaha’s offer, the Union Pacific Railroad (UPRR) offered Gracie a special train take her from Los Angeles to Omaha, making campaign whistle stops along the way. After quite a bit of coaxing from her husband and the crew, she finally agreed and made 31 stops between May 8th and May 14. Four of those stops were in Wyoming, including spending Saturday night and all day Sunday in Cheyenne before dipping down into northern Colorado Monday morning. 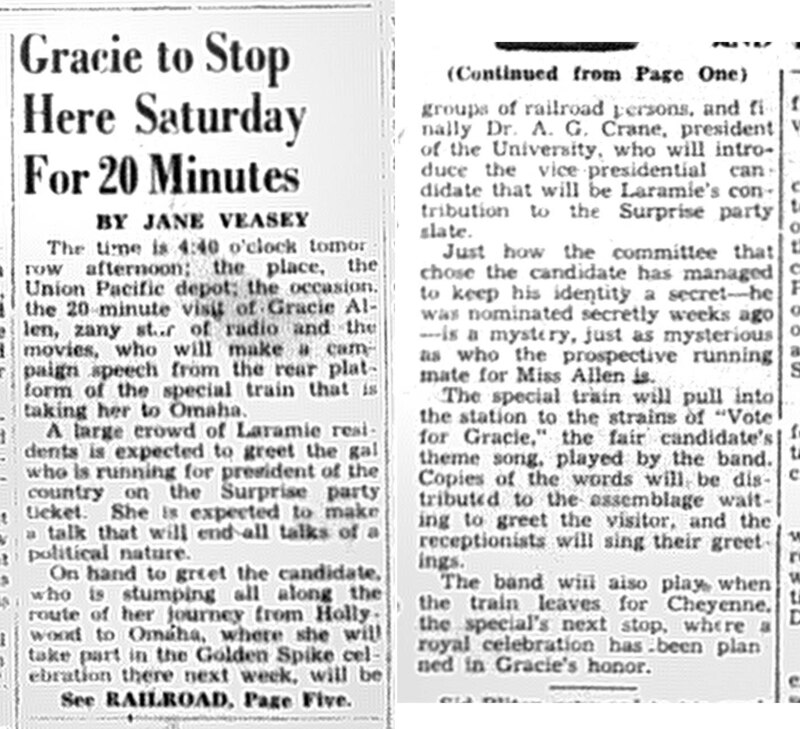 On Saturday, May 11th, the “Gracie Allen Special” arrived in Wyoming. Her first stop was at in Rock Springs where she, George and her announcer spoke briefly from the train platform. The city presented her with a kangaroo sculpture made out of coal from a local mine by Elgin “Bud” Meacham. The kangaroo was Gracie’s chosen mascot for the campaign. The Rock Springs Rocket estimated that 5,000 to 6,000 were on hand to greet the train, though she was not the only excitement for the day. The visit coincided with the second annual Golden Spike Days, celebrating the 70th anniversary +1 of the completion of the transcontinental railroad. The 20 minute stop in Rawlins was scheduled down to the minute. That afternoon, she stopped at Laramie for another 20 minute visit. 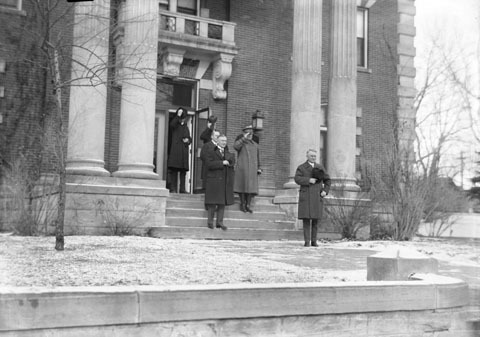 There, Dr. A. G. Crane, president of the University of Wyoming, introduced the candidate and announced his willingness to join the “Surprise Party” as Laramie’s representative. 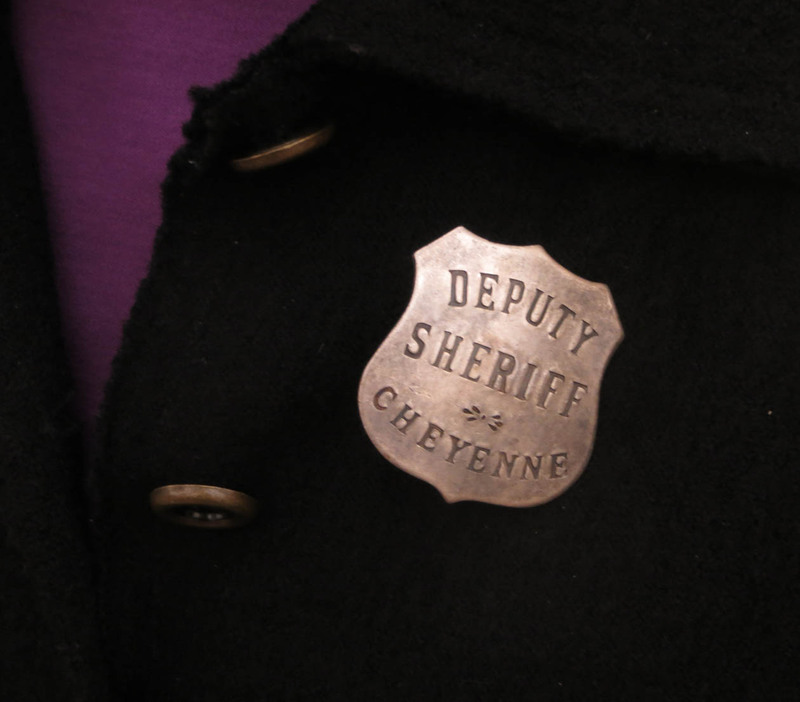 At 7 pm, the train pulled into Cheyenne, its final stop for the day. 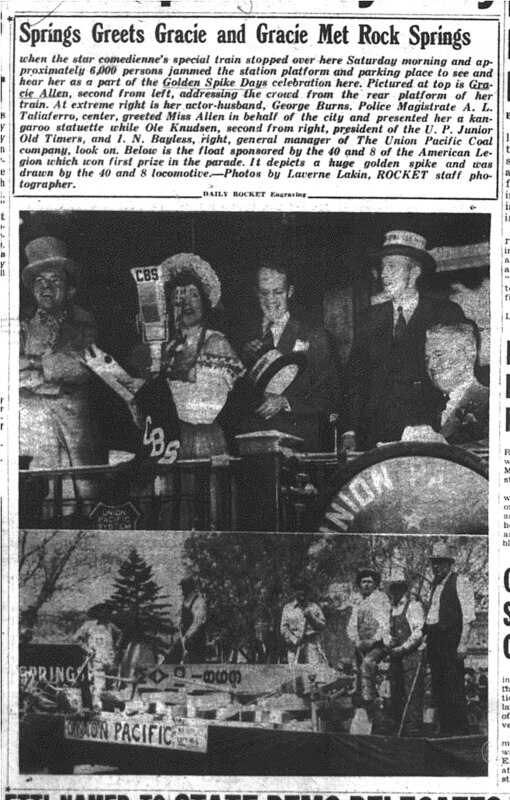 Gracie, George and Governor Nels Smith then rode atop the Black Hills Stagecoach, led by a torch-lit parade up Capitol Avenue of majorettes, bands and Union Pacific old timers. On the lawn of the Supreme Court Building, she gave her stump speech and again in the Junior High auditorium before being whisked away to the Frontier Park for a “ball” in her honor. After spending a quite Sunday morning, George and Gracie visited the Governor in the executive mansion and touring Cheyenne and Fort Warren. One stop was the Veteran’s Administration to visit veterans and entertained patients. An afternoon rain shower canceled a planned appearance at a Warren Bowl sing-along. Born in England in 1838, he claimed to have been a cook, scout, frontiersman, hunter, and dealer in hides and antlers. According to one account, he arrived in Cheyenne in 1870 but he seemed to favor haunting Crook County for reasons that we can only guess. His most notable personal memory in that part of the state was not an evangelical achievement but the killing of a rare white deer. 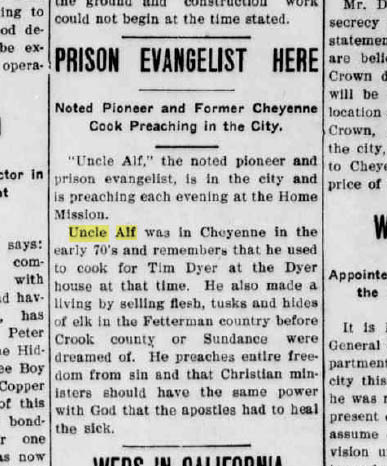 Uncle Alf occasionally made visits to Cheyenne, as this 1905 article notes. From the mid-1890s through the early 1900s, Uncle Alf traveled around much of eastern Wyoming, preaching to jail inmates, church members, and cowboys. Sometime after 1910, he moved to Los Angeles where he continued his prison ministry up and down the Pacific Coast. Most observers suspected he was a retired clergyman from the East who had taken up prison work to round out his career. He died in Walla Walla, Washington on June 17, 1919. Itinerant ministers, including Uncle Alf, cowboy evangelists and the like, were quite common in the American West. They were often colorful characters whose personal quirks and idiosyncrasies drew a lot of public curiosity. Uncle Alf was well known in some press and religious circles, but the surviving, published accounts only give us a glimpse into the man. It would be nice to know more about him. Sadly, like many of his contemporaries and counterparts, Uncle Alf may remain only as a footnote in history. William A. Richards was born in Hazel Green, Wisconsin on March 9, 1849. During his early life he resided in southwestern Wisconsin and northwestern Illinois. Employment during his teen years consisted of farming and, after completing high school, teaching school, except for one brief sojourn away from his home state. Richards went to Washington D.C. in 1863, during the Civil War. He was not allowed to enlist for military service because of his young age, so for several months he drove an ambulance for the Signal Corp. He returned to Wisconsin in 1864 and resumed teaching, supplementing his income by farming during the summer. Richards headed west in 1869. After brief employment in Omaha, he joined a government surveying crew working in southwestern Nebraska. He continued in that line of work for several years, including surveys of Wyoming Territory’s southern and western boundaries during the years 1873 and 1874. He moved to California where he married Harriet Alice Hunt on December 28, 1874. They settled in Santa Clara County, where Richards farmed and served as County Surveyor. 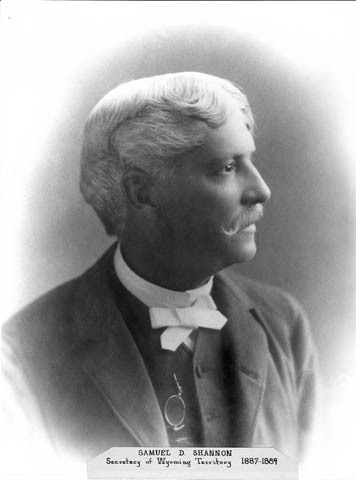 Richards returned to the mountain west in 1881for health reasons, settling in Colorado Springs where he served as City Engineer and Surveyor of El Paso County. W.A. Richards speaking to the crowd gathered at a land opening. 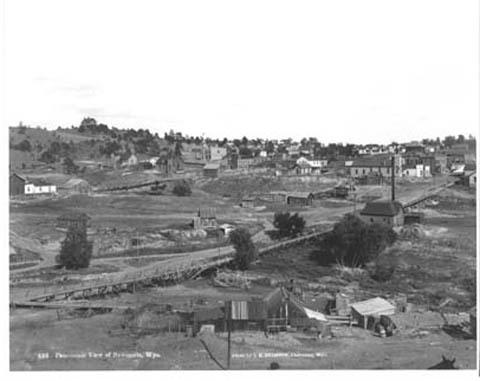 Richards applied for a desert land entry and relocated to Johnson County, Wyoming in 1884. He improved the property, which became a viable stock ranch and the family home. His public service career branched away from surveyor duties when he was elected County Commissioner in 1886. 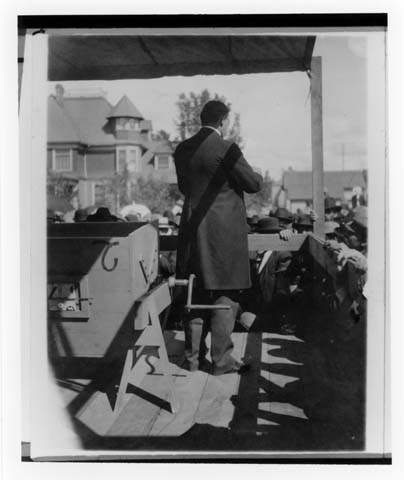 However, his extensive experience in the field continued to benefit his career as he was appointed Surveyor General of Wyoming by President Harrison in 1889. He served in that capacity for four years. 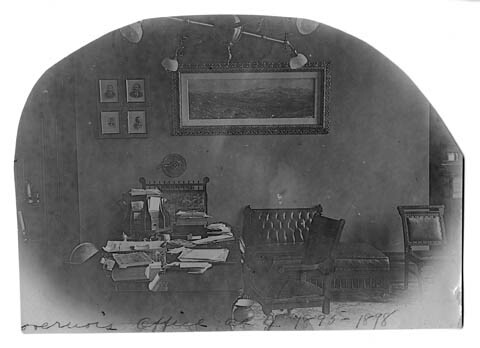 The Governor’s Office in the Wyoming State Capitol Building during Richard’s term in office, 1895-1899. 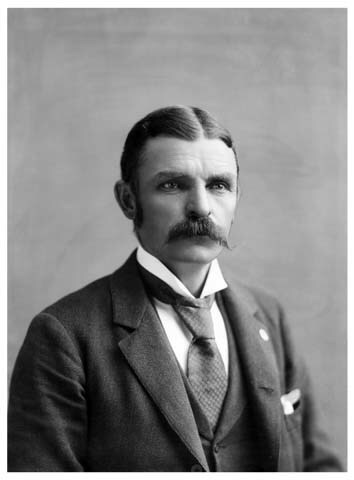 Wyoming’s Republican Party nominated Richards for Governor in 1894 and he easily won the election. One of the more notable legal disputes in the state’s history took place during Richards’ term as Governor. It was presaged in Richards’ speech to the 1895 legislature, in which he stated “it is not possible to prevent the wanton destruction of large game by Indians by the enactment of a statute unless special provision is made for its enforcement.” Bannock Indians, who primarily resided in Idaho, but hunted in western Wyoming, had been hunting game under the provisions of the Fort Bridger Treaty, which gave them permission to hunt on unoccupied lands of the United States. In 1895, a Bannock named Race Horse was arrested by Uinta County Sheriff John Ward for violating the games laws of Wyoming (he had killed seven elk the previous July). Initially the U.S. Circuit Court in Cheyenne ruled that the state’s game laws did not apply to the Indians. 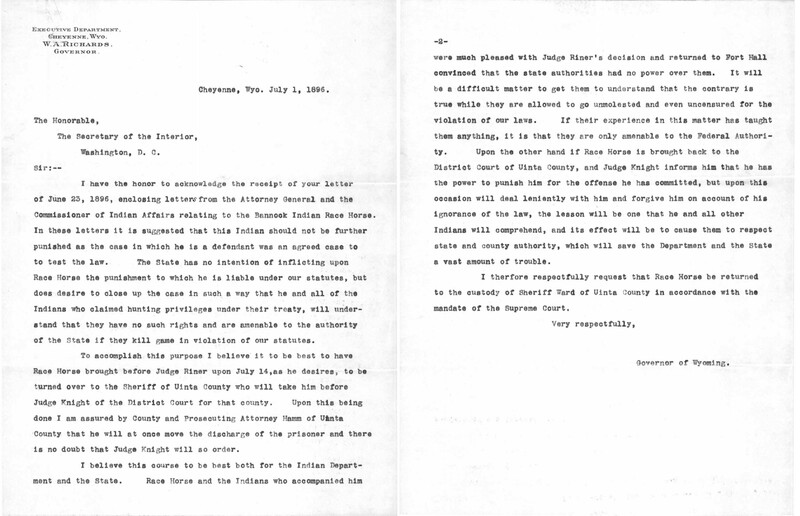 The decision was appealed to and overturned by the U.S. Supreme Court, which ruled that the provisions of the treaty were repealed by Wyoming’s admittance to the Union, which gave the young state all the powers of other states to enforce such laws. In this letter to the Secretary of the Interior, Gov. Richards makes the case for the Bannock Indian Racehorse to be taken into custody to serve as an example. Also in his 1895 message Richards observed that the state’s agricultural growth had not been what was expected in recent years. He decried the “vast wealth of land and water lying idle, side by side, awaiting only the magic touch of labor and capital, intelligently combined, to be coined into wealth.” The Carey Act had been passed by Congress and approved by President Cleveland the previous year. It was designed to encourage the settlement of arid lands, which would be reclaimed for agricultural purposes. Unfortunately, Governor Richards’ lament could be echoed in the decades following his message, as only a very small percentage of lands available under the Carey Act were successfully turned to profitable agricultural endeavors. Richards also looked to the past in his message, recommending a “moderate appropriation” to establish a State Historical Society to collect and preserve records documenting the early history of the state. The Society was established during that legislative session, with a mission eventually inherited by the Wyoming State Archives. 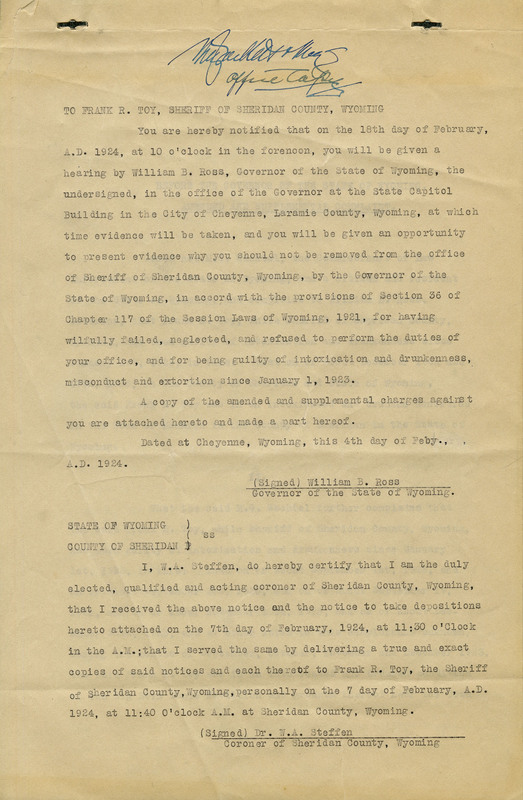 Late in 1895 Governor Richards received a signed petition from noteworthy residents of Fremont County as well as other letters seeking the pardon of one George Cassidy, who had been found guilty of horse stealing the year before. 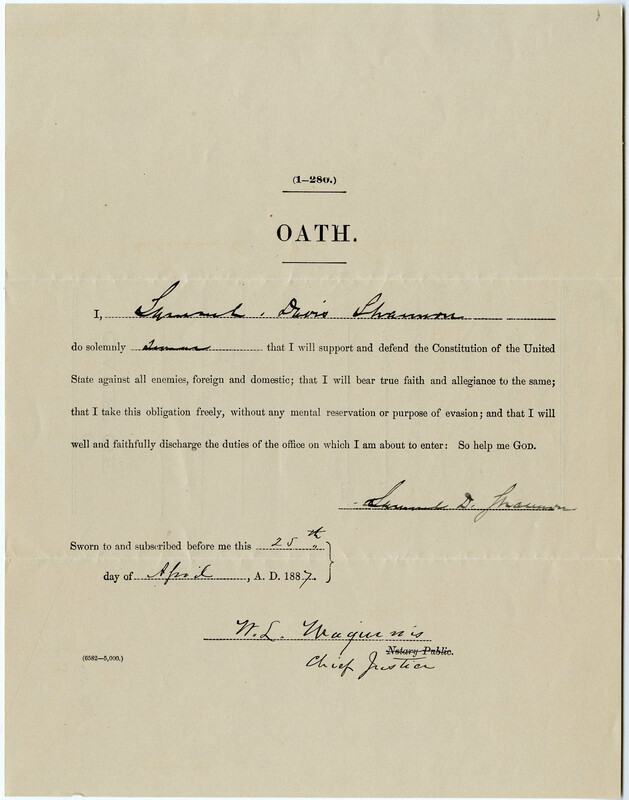 Signers of the petition believed that Cassidy’s “release at this time can work no harm to the peoples of Fremont County, and may be the means of accomplishing much good.” The petitioners hoped a pardon would motivate the young man to become a law abiding citizen of the Territory. Cassidy apparently made statements that were in accord with these hopes and Richards pardoned him after he had served 18 months of a two year sentence. However, it wasn’t long before it became apparent that the kind intentions of the petitioners would not be realized in the case of “Butch” Cassidy (born Robert Leroy Parker). The Spanish-American War began in April 1898 and Richards made sure Wyoming responded quickly to the call to arms. National Guard troops were mustered in on May 10. Richards went to San Francisco when the troops were ordered there, and “saw that they were well-equipped, and had good quarters in a transport ship” which would take them to the Philippines. 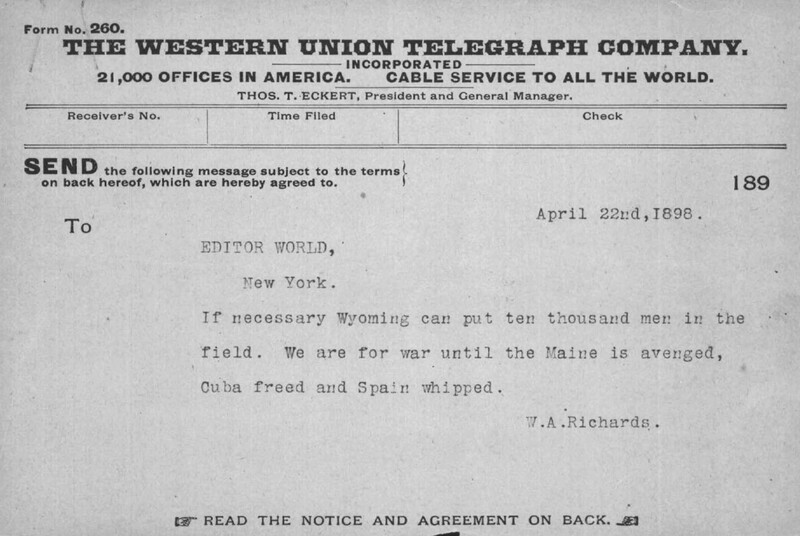 During the Spanish-American War, Governor Richards sent this telegram to an editor in New York with a statement equivalent to today’s press release. Richards did not seek re-election 1898. However, he was not out of public service long as he was appointed Assistant Commissioner of the General Land Office in Washington D.C. in March 1899. He was appointed Commissioner of that office in 1903 and served in that capacity for four years. In 1909 he was appointed Commissioner of Taxation for Wyoming, a position he held until the administration changed following the 1910 election. 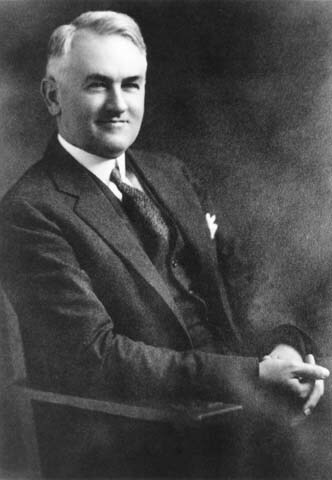 1912 found Richards in Australia where he studied irrigation development and caught up with old friend Elwood Mead, former State Engineer of Wyoming, who was serving as the Chairman of the State Rivers and Water Supply Commission of Victoria. Richards died there on July 25. W.A. 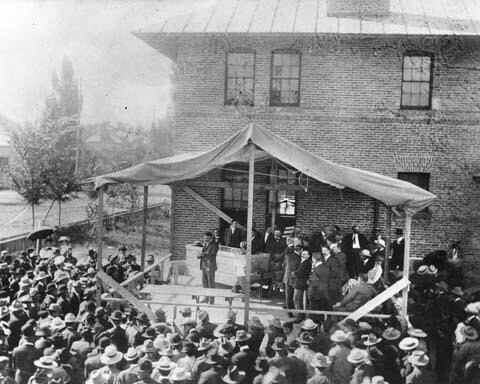 Richards reads the proclamation at the grand opening of the land office at Provo, Utah on August 17, 1905. 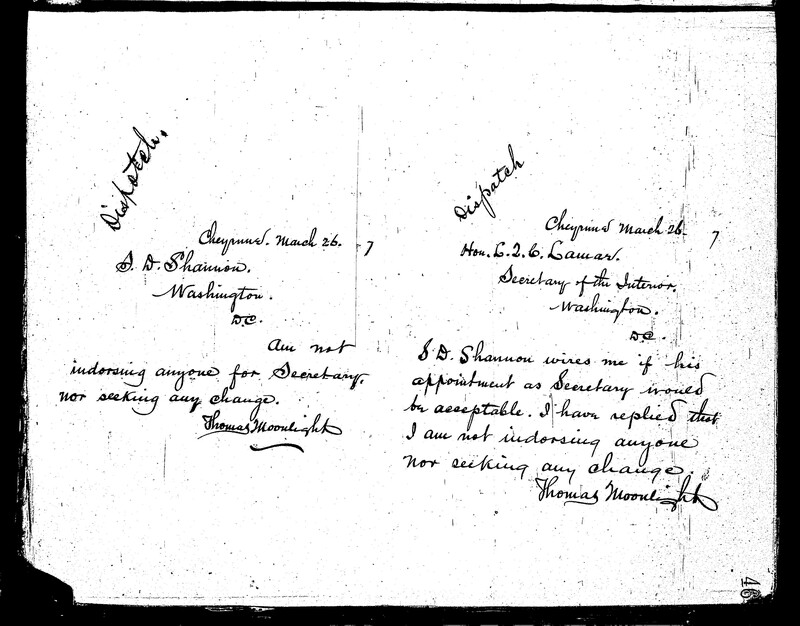 In addition to the routine records created and received by a state executive at the time, the records of Governor William A. Richards include information on the organization of a Wyoming battalion for the Spanish-American War, the Race Horse case and other matters related to Native Americans, Thermopolis Hot Springs, and elk around Jackson Hole.